There are like a bajillion different Android tablets out there. And there are virtually zero reasons to talk about most of them. The Nexus 7 is your reigning champ, the Kindle Fire HDX is your barely-recognizably-Android alternative, and that's about it. But Lenovo's at least giving it a shot with—get this—a kickstand. 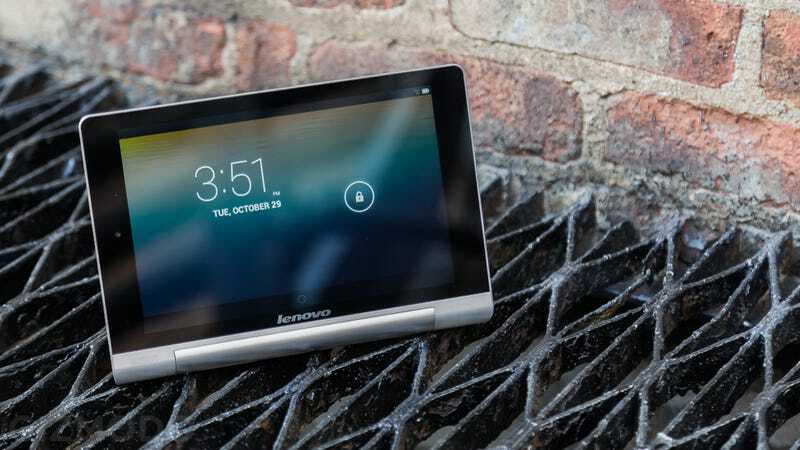 Meet the Lenovo Yoga Tablet. It's exactly what it sounds like: an Android tablet with "poses" like the (fantastic) Yoga laptop. The unusual cylinder on the side houses a tiny kickstand that flips out to turn your tablet into a standing display, all without a case. Yeah, it's pretty strange. But it's interesting. It's also not just a kickstand. That weird cylindrical bulge—which serves as something of a grip—also houses a hefty battery, one that Lenovo says can offer some 18 hours of screen time, way more than any other tablet on the market. And those pair of skills offer the Yoga Tablet some unique advantages in addition to a noteworthy look. A noteworthy look that's suspiciously similar to the Apple wireless keyboard. It might look like it'd feel weird to hold, but in our limited time with the tab—in its 8- and 10-inch versions—it's remarkably comfortable. That battery bar not only offers a good one-handed grip, but also puts the bulk of the tablet's weight right in your palm, that's a super useful quality to have, especially in a 10-inch. Unfortunately, despite its exterior innovations, the Yoga Tablet is a pretty run of the mill so far as specs go. Both the 8- and 10-in versions sport quad-core 1.2GHz processors, 1GB of RAM, serviceable-but-not-fantastic 1280x800 displays, 16GB of onboard memory with a microSD expansion slot for up to 64GB more, and run a lightly skinned version of Android 4.2. The small and large versions available in stores tomorrow for $250 and $300 respectively. So a bit expensive for an somewhat underspec'd small tab, and kinda cheap for a 10-inch, but with a seriously sub-par screen. But what's really interesting here is the design, a tablet that's taking a chance at being more than a slab and focusing on a strange body that emphasizes battery life and—in a roundabout way—ergonomics. And while we might not recommend you run out and buy one right away, these certainly worth looking at and going "Hmph!" And when it comes to weirdo Android tablets, we're always glad to see another.